Bizet won the Rome Prize in 1857. The Prize enabled Bizet to enjoy the life of an independant artist in Rome without financial concerns. 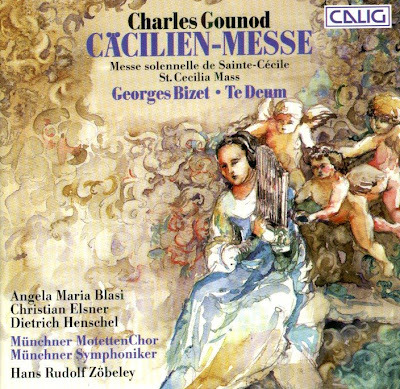 He began many projects during his years there but completed only a few of them, including the Te Deum. He began working on it in February 1858, had the fully instrumented score ready in May, and submitted it to the Rodrigues Competition in Paris. Only recipients of the Rome Price were eligible to participate in this competition for new sacred compositions. The prize came along with a handsome sum of 1.500 francs, and Bizet already had plans to use the prize money for a trip to Naples. He was thus very disappointed when Barthe was awarded the prize. Although he regarded himself primarily as a victim of Paris intrigues, he was honest enough with himself to admit that he did not have the religious convictions necessary to compose such a work. Bizet also did not have a feel for Latin. In numerous cases the musical accentuation conflicts with the accentuation of the Latin language. Although he had set himself the task of learning Latin in Rome, he cannot have progressed very far with his studies. Moreover, he took a number of liberties with the traditional text. He inserted the Sanctus out of its usual order and entirely ommited two verses, Et rege eos and Dignare Domine. The members of the Paris jury can hardly have allowed such imperfections to go through. On the whole the Te Deum may be said to pick up on the style of the Italian church music of the time. The Maestoso at the beginning and end in particular is of the sort of disarming exteriority for which the Italians are both criticized and admired. Bizet, the music dramatist, shows his fire in two passages. He designed the verse Te ergo quaesumus as an operatic prayer scene, as a preghiera. The chromatic thirds together with the violin cantilena soaring up into the heights may seem to border on kitsch to today's hearer, but in Bizet's times they signified an unbridled outpouring of emotion. The Judex crederis esse venturus also takes the form of a dramatic scene. The choir's cries of horror, judex, judex, resound into the Last Judgement. The choir thus not only tells of the events but also participates in it. Bizet may have been familiar with the important settings of this passage from Berlioz's Te Deum. This work of Bizet's youth also heralds a major musical talent. The Compact Disc was released by Calig, 1996, (DDD). CAL 50956.